Overall, the GoPro Fusion is a 360-degree camera that's stupidly simple to shoot with and capable of producing very impressive video. Its real win is OverCapture, though, which on iPhone is utterly brilliant. GoPro has finally launched the Fusion action camera. Like the Hero and Session, it's designed to be strapped to virtually any part of you of your kit - your bike, shoes, car or any number of other objects via accessory mounts. The Fusion is just as much an action camera as the others, except this one shoots in 360 degrees and adds some impressive features. Throughout the past six to seven months we've spent time looking at, playing with, and - finally - testing the GoPro Fusion for ourselves. It's GoPro's first attempt at a full surround view camera, and it's a great start. GoPro has kept things fairly simple on the design front. The Fusion is a square camera that's noticeably larger than the Hero 6, but it is roughly the same thickness and has a similar finish. GoPro retained the dual-tone grey colour scheme and the grippy diagonal lines around the edges. As you'd expect, it also has the same two-button control system to keep things familiar and simple for existing users. There's a camera on the front and the back of the Fusion, as well as the usual square monochrome screen on the front which shows basic information during shooting, just like the Hero does. The one thing it doesn't have is a touchscreen or viewfinder - but having one on a 360-degree system doesn't really make any sense, so it's a fair omission. Using the usual mounts, you can attach the Fusion to most of the existing selection of GoPro accessories as well as some new custom designed ones, although due to its size it won't fit in the GoPro Karma mount. That means no drone flying for this gadget just yet - or perhaps ever, as the Karma looks to be GoPro's first and last drone to launch. The Fusion is built to withstand water up to 5m (16ft), too, which isn't quite as deep as the new Hero 6 Black can handle, but then it's not specifically designed for underwater shooting. Due to the fish-eye lenses on either side, water refracts light too much and this will produce a less-than-unusable shot. The waterproofing does, however, mean that you can use it for shooting most water-based sports or activities. It's fine being splashed or temporarily submerged. Two other important design features are the two flaps that cover the essential ports. Just above the power/mode button on the left edge is where you'll find the Type-C port sealed behind a small hinged flap. On the opposite side, around two-thirds of the surface is the battery door - in here you'll find the removable 2,620mAh battery and the two microSD card slots; one for each of the cameras. On the whole, the Fusion feels well made. The hinges and clasps on these external doors seem to hold well and can be completely removed if necessary. Similarly, you can remove the mount from the bottom edge, via two hinges that flip upwards when you want to unlock it. Being a 360-degree camera, the Fusion is equipped with two 180-degree lenses that capture everything all around the device. It shoots 5.2k video, and its sensors and optics make this one of the best action cameras we've seen. And that's not because its footage can be viewed in a VR headset like the Gear VR (as cool as that is) - it's what it does to transform the 360 video in to a flat video that anyone can watch. With so many people using their phones on the go, not donning virtual reality headsets, GoPro decided it made sense to develop a way to transform 360 captures into videos that look great on a flat screen. Using its OverCapture feature, you can choose which part of the scene to display. That can mean a nice flat Full HD shot of one part of the action, or a wider-angle selection. It's even possible to have a "tiny planet"-like view that shows all of the video in on-looking sphere form. More importantly, though, when editing the footage you can pan through select parts, or transition between the tiny planet and more traditional flat video scenes smoothly in one motion for a really dynamic effect. As an example, you could have the Fusion set up on a tripod, completely still, and have a bike or dog run past it. Then, in the edit, you can follow that action almost as if you were moving a regular single video camera. So when you go to show your friends, or watch it back on a TV, you don't miss any of the important action. As you're watching it back, it looks as the the camera itself was being moved, but it isn't. It's all in the OverCapture technology and the way it can switch, transition and edit. It's pretty phenomenal. What this does for regular consumers, and technophobes, is it gives them the ability to make amazing action videos. You'll be able to make professional looking, immersive video, and barely lifting a finger to do it. Arguably, you actually get a better experience from the Fusion's results on a flat mobile or TV screen than when strapped into a headset - although even then, the video quality was good. For VR users, the experience is enhanced further by the 3-way microphone system built into the top of the camera. With headphones in, the 3D audio moves around as you move your head, changing your view within the video. As for still photos, the entire stitched 360-degree image is 18-megapixels inside. GoPro Fusion: How do you shoot? Shooting with the camera will feel very familiar to those who have used GoPro cameras in the past, keeping familiarity within the GoPro camp. You switch the camera on be pressing and holding the power/menu button, then start recording by pressing the red shutter button on the front. You also use these two buttons to cycle through the shooting options, and various menus on the camera's little monochrome screen. You can also use the voice commands (with a hit-and-miss success rate). One key part of shooting with the Fusion is actually an accessory that comes with the camera: the Fusion Grip. This half selfie stick, half tripod acessory is incredibly versatile. You can have it stand up on the floor, or you can hold it, and it's able to extend up to 56cm in length. What's more, with the camera placed in the correct position (directly in line with the Grip) the cameras can magically get rid of the Fusion Grip from the footage, so it almost looks as if the camera was hovering in the air. That is very impressive. GoPro: What's it like to edit? Up until January 2017, the process of working with footage from the Fusion was still a little too involved to recommend to just anyone. As promised at an earlier time, GoPro has - at last - launched the OverCapture feature within the iPhone app. On mobile, you connect to the camera the same way that you would any other GoPro camera. That's to say you load up the app and connect using Bluetooth and Wi-Fi. From here you can look through the camera's footage and download the clips you want. Being a flat screen, the video shows up in a similar manner to how other 360-degree video would and you can move within it to see what it looks like. To change angle, you move the phone around and you can manipulate the field-of-view using touchscreen gestures. Swiping around changes the angle, pinching in and out increases or decreases the field of view. It has to be said, until OverCapture was released on mobile, using the Fusion felt far too complicated. But with OverCapture on mobile, it's transformed into something quite magical. Once you've chosen the clips you want to download on to your phone, you then open them and tap the OverCapture icon that looks like a broken circle, then press the main icon on the screen. It turns to a red square. From this point, you manipulate, move and adjust angle as you did when looking at the footage the first time - except now it's all being captured. It's particularly useful for following action. Once you're finished, you can watch it back with all your panning, zooming and FOV changes intact. If you're happy, you can save it, if you're not then you can go back and do it again. It's almost too simple, but that's why it's great. What's more, the software seems to improve the look of the footage, making it sharper, more vivid and adding contrast. On desktop it starts with downloading the Fusion Studio desktop app for PC or Mac. Once that's done, you connect the Fusion camera to the computer and import the media. Depending on how much you have on the camera, this can take some time, especially since all the files will have been captured in 5.2k resolution. Once imported, you can then look through them, trim them, change angles, adjust colours and add any videos you want to a render queue. Once rendered, the final files are then automatically exported into a new folder in your computer's main image folder. If you don't have Premiere Pro, it's probably best to edit them and export in either a Tiny Planet or Fish Eye views if you want to watch them on a flat screen. As part of downloading and installing the Fusion Studio software, you also automatically download plugins for Premiere Pro, and these are necessary to produce some of the editing effects that mobile OverCapture does. This is where the steeper learning curve comes in. If you're already a whizz at using keyframes for adding motion into videos, you shouldn't struggle too much, but if you aren't then things might seem a little tricky (at least to start with). Once footage has been exported to a file, you then need to import into a new project on Premiere Pro. Once you've added your first clip to the preview timeline (as normal), go to the Effects tab and find the GoPro plugins in the video effects menu. To play with camera angles, and add animations, drag the GoPro Reframe plugin into the clip you want to edit and then access the controls in the Effects Controls tab. Now you need to manually adjust FOV, yaw, pitch and roll to get the exact frame that you want at the beginning and add a keyframe. To then smoothly go to your next chosen frame/view, you add another keyframe where you want it, and then adjust the yaw, pitch, roll and FOV here. Now when you play between those two points, it should move between them, almost as if the camera is being controlled directly. It takes some effort, practice and time to get it looking good, but it works. Once that's done, you export the video as a regular 16:9 video if you want it flat (make sure that VR box isn't selected). The end result is a decent looking 1080p video, which - with some colour correction - can look really good. One thing we have noticed at times is the Fusion's promise of seamless video doesn't always entirely hold true. Some angles within the footage can show a seam or stitch-line where the two cameras' field of view overlaps. Nothing major, but still noticeable. One of the things we love about the Fusion is how long the battery lasts. It's long enough to take it out for the morning without worrying we'd empty it in a matter of minutes. Our first test took us out on a journey to chop down our own Christmas tree. We shot around 10-15 minutes of footage in total at the 5.2K 30fps setting, as well as approximately 20 minute time lapse capture - and it still wasn't close to being empty, instead it was down to around 45 per cent. That suggests you can probably expect somewhere around an hour of shooting time. That time will undoubtedly increase if you opt to shoot at 3K resolution rather than the full 5.2K res. GoPro Fusion: When can I get it? 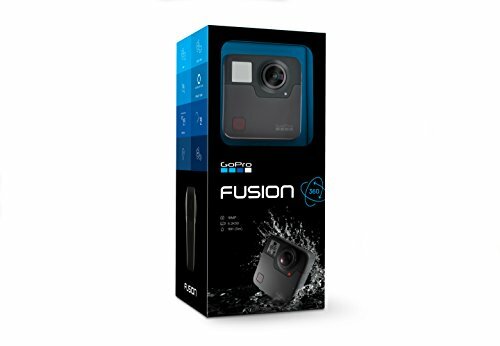 Pre-orders for the GoPro Fusion began in October 2017, with orders already shipping as of the end of November 2017. Desktop solutions for editing are already available, with the mobile OverCapture feature being built into the GoPro app for iPhone (while Android will be live sometime at the beginning of 2018). The GoPro Fusion is one of those interesting products that has been continuously progressing and improving over time. Now, with the full release of OverCapture for iPhone, it feels like a more polished consumer-focused product overall - although we're still waiting on the Android version. Great as the camera and software are, there's no denying that the Fusion is one pricey bit of kit. As great as its feature list is, and how impressive OverCapture is, it still feels like it costs a little too much - hence our slightly conservative score.